Hotels on the Suffolk Coast don't come much better than the 4 star Brudenell in Aldeburgh. Overlooking the beach the Bru's 42 rooms - all decorated in cool sea-blues and sunshine-yellows - have stunning views of the sea and of the River Alde with its surrounding marshland. The Bru is in the perfect spot for exploring the Suffolk coast and country, whether on foot or by bicycle, and there are a number of attractions close by, such as sailing on the river, various nature reserves and Snape Maltings Concert Hall, home of the Aldeburgh Festival. Guests need not travel far for their evening meal as the Bru has a two AA rosette-awarded restaurant overlooking the beach offering seasonal delights. Another delight to be found in Aldeburgh is The White Lion Hotel. Situated opposite Aldeburgh's shingle beach, where fresh fish is sold from wooden huts which line the shore, some of its 38 bedrooms have beautiful sea views as far as the eye can see. The restaurant has a menu packed full of delicious, fresh Suffolk produce, and guests can dine in the newly refurbished restaurant or outside on the beach-facing bar. 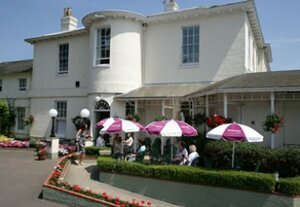 With its friendly atmosphere, cosy log fires and fantastic food, The White Lion Hotel is a wonderful seaside hideaway. 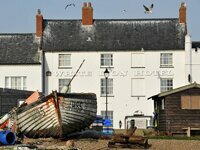 For more information on the area please see our guide to the seaside town of Aldeburgh. Whilst not strictly on the coast, the relaxed foodie town of Orford is on the River Alde just south of Aldeburgh, and is a great spot to stop for refreshment and lunch or dinner, or to base your stay while you are exploring the wonderful Suffolk coast. The Crown & Castle, Orford is a 16th Century hotel & restaurant with spectacular views of Norman keep, all that remains of Orford Castle. Owners Ruth & David Watson invite you to sample some of their award-winning food before retiring to one of their modern and stylish bedrooms - and all at very reasonable prices! Find out more by clicking on the link above. 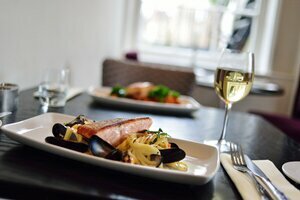 Located in the centre of the unique coastal village of Thorpeness is the Dolphin Inn with 3 well appointed 4 star bedrooms, a fantastic restaurant with an enthusiastic chef, a bar serving a wide variety of whiskeys, ales & local beers, & a superb wine list. Very close to the beach at Thorpeness, the Dolphin Inn boasts a large beer garden so you can sit outside and admire the unique architecture of Thorpeness. In the winter cosy fires and delicious food will mean you don't stray too far from this Inn! 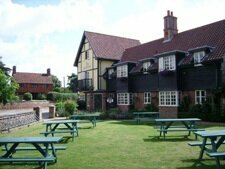 For a more informal break on the Suffolk coast, The Ship, Dunwich is a treat not to be missed. 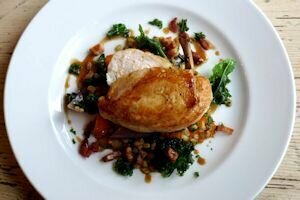 Here you'll find a cosy Suffolk Inn offering delicious home-made food, Real Ales and - of course - a very warm welcome. The Ship is located five minutes from the beach, and the ruins of Dunwich Monastery are close by. There are 10 en suite rooms to choose from - including 4 rooms in converted barns - and some have wonderful marsh and sea views. There is an enormous garden featuring an ancient fig tree, and The Ship makes an ideal base from which to explore RSPB Minmere and the Suffolk coast. Gunton Hall Holiday Resort Hotel combines the best of coast and countryside, with a huge amount of activities and attractions to choose from. 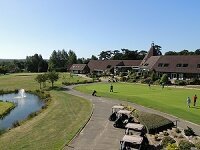 Activities include bowling, swimming, sauna, steam room, fitness studio, cycle hire, snooker and pool, croquet and pitch 'n putt. Or, for the outdoor enthusiast, enjoy the beaches of nearby Lowestoft and Southwold, or try your hand at freshwater fishing at the Hall. 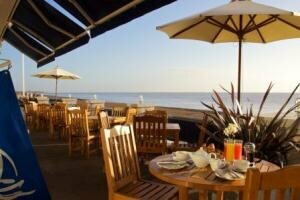 Another fantastic Beach Hotel for you to try in Suffolk. 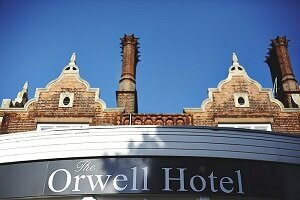 The Orwell Hotel is an independent 60 bedroom hotel located a few minutes walk form the popular seafront at Felixstowe. They offer free parking, and have 3 restaurants to choose from serving a variety of food all day including a afternoon tea. They also host many events throughout the year, click the link above to find out what's on. Just 25 metres from Felixstowe's seafront, Promenade and a short walk to the town centre, you will find the warm and welcoming Norfolk Guest House. This award-winning, family-run Guest Housen offers comfortable en suite rooms complete with all mod cons and a variety of delicious, home-cooked breakfasts - including the Full English, a lighter breakfast choice of salmon and scrambled eggs plus vegetarian options. 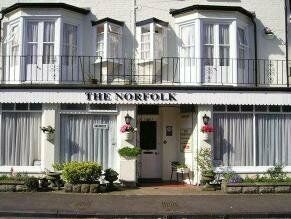 The Norfolk is perfect for a wonderfully British holiday at the seaside. 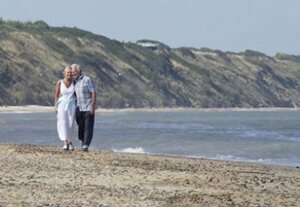 We have a wide range of Suffolk beaches - from pebbles at Aldeburgh, fine sand in Kessingland and Cliffs & dunes in Dunwich - & you can find fantastic Hotels along the Coast to stay among them. So why not pack up and head for one of Suffolk's many coastal hotels? Whether it's for sand and sun in Southwold, or a pampering retreat at the Holiday Resorts, Suffolk has great options for coastal escapes.